Seiban [raw savages] hunting fish and birds in the mountains. 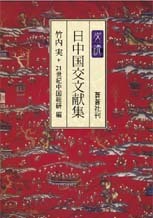 Taiheiki alludes to the 40-volume war epic Taiheiki [Chronicle of the great peace], compiled by several authors and first published around 1371. The epic spans the fall of the Kamakura shogunate to the rise of the Muromachi shogunate in the 14th century, during which the imperial court split into southern and northern factions. Taiheiki is frequently used as a "mitate" or "ironic analogy" to mean that an era supposedly defined by a "great peace" was, or has been, anything but. Several works, historical and fictional, have been titled Meiji taiheiki, including an historical novel by Kaionji Chogoro (1901-1977), serialized in the Yomiuri shinbun right after World War II, and published as a book in 1952. Murai's series is perhaps the very first such work to be so titled. Done in the typical manner of an illustrated woodblock printed book at the time -- every character, and its reading, hand carved -- its text is a good example of the fairly readable vernacular writing style of the day. 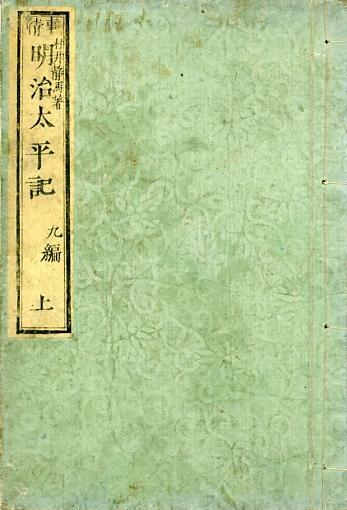 The volumes cover a number of civil wars and disturbances, including the Battle of Ueno Hill between the Shogitai and new government forces on the eve of the Meiji era in 1868, and the Taiwan Expedition of 1874. The color prints two volumes among others that cover these events are introduced below. Each of the 24 volumes (hen) consists of a pair of booklets (joge), each consisting of about 20 leafs (40 pages) between soft covers. 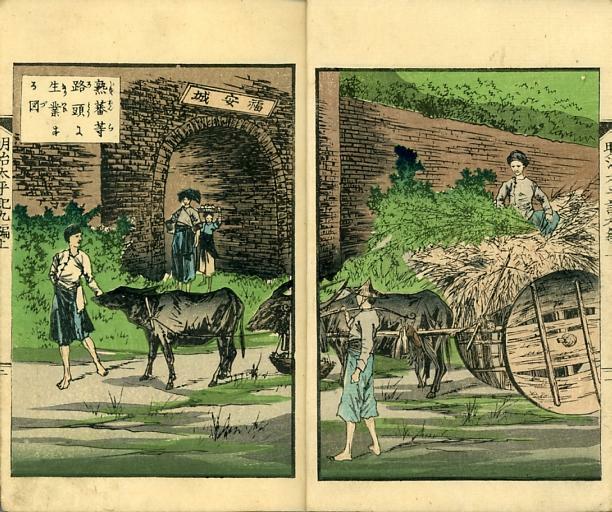 Each booklet begins with two two-page color woodcuts, and the text of each booklet is interspersed with several one-page and two-page black woodcuts. Murai Shizuma [Seima?] (村井静馬), the compiler, may have been a Nagasaki shizoku. He also appears to have been the printmaker Utagawa Fusatane. Utagawa Fusatane was a student of Utagawa Sadafusa. 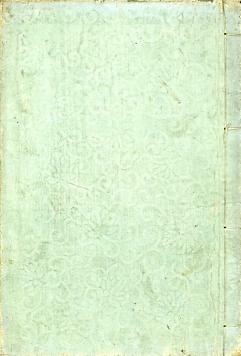 His signatures include Osai (櫻斎), Isshosai (一笑斎), and Ippyosai (一瓢斎). He seems to have been active from around the Ansei period (1854-1860) to around 1898, but his dates of birth and death are not known. Tsujioka Fumihiko is the "Tsujibun" who reprinted Tonichi nishikie from blocks acquired from Gusokuya. 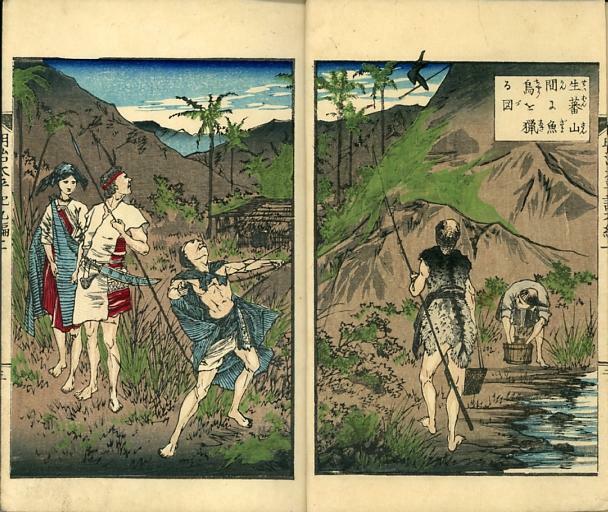 Gusokuya, as Fukuda Kumajiro, published at least one Seinan War triptych designed by Osai Fusatane / Murai Shizuma on 4 June 1877 (otodoke date). Entitled (Denbun) Banmin kofuku [(Hearsay) All people drum bellies], it shows the empress dowager and the empress, and other imperial ladies, handsewing cotton dressings (menzanshi) for wounds, to be sent to the warzone in Kyushu. The title implies that the world is peaceful, the people have plenty to eat, and everyone is taking joy in the comfort and peace provided by the imperial order. (Kishi 1977.8:56-57). Sensai Eitaku (1843-1890) was a Kano school drawer who also designed the Kakushu shinbun zukai no uchi series of news nishikie which featured stories by Tentendo Dondon. Eitaku drew for all manner of publications, woodblock and otherwise. He is credited as the designer of a large panoramic lithograph dated 1875, showing ministers of China (Shina) reading the agreement of reconciliation concerning Taiwan, in Peking in 1874, at the Office for General Management of Foreign Relations (C. Zongli Yamen, J. Sori Gamon), an advisory body set up by the Qing Court in 1861 to deal with foreign affairs. 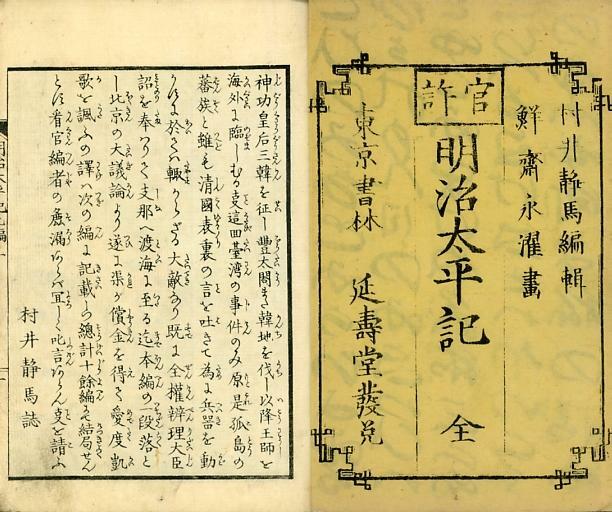 A Japanese version of the agreement, and other particulars about the negotiation and the negotiators, and a small image of Eitaku's lithograph, can be seen in "Nisshin shuko joki to Taiwan shuppei" [Sino-Japanese amity terms and the Taiwan expedition, Chapter 1 of Takeuchi Minoru (editor), Nicchu kokko bunken shu [Collection of sources on Sino-Japanese relations], Tokyo: Sososha, 2005, 471 pages. Click on the cover image to the right to view a pdf file of this chapter, posted by the publisher as a sample of the contents of the book. 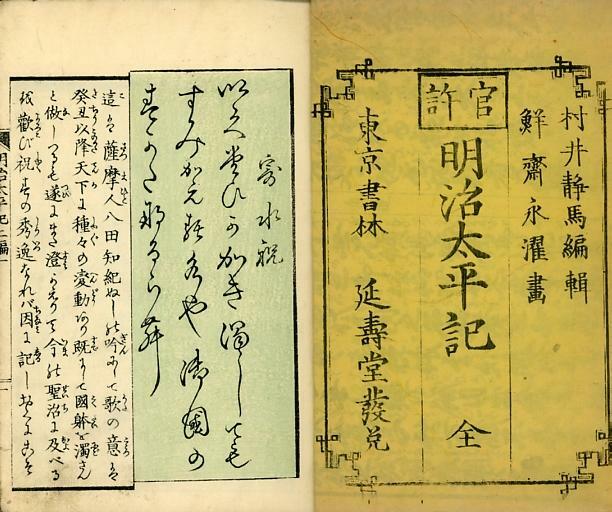 The first two of the 24 volumes of Meiji Taiheiki came out in 1875, when many books and nishikie were being published to mark the 7th anniversary of the Shogitai stand at Ueno Hill. It was also the 7th memorial of the Byakkotai (White Tiger Brigade) stand at Aizu Wakamatsu, which took place shortly after the Shogitai incident. And of course the Taiwan Expedition, given so much publicity in 1874 just the year before, was also fresh in everyone's mind. 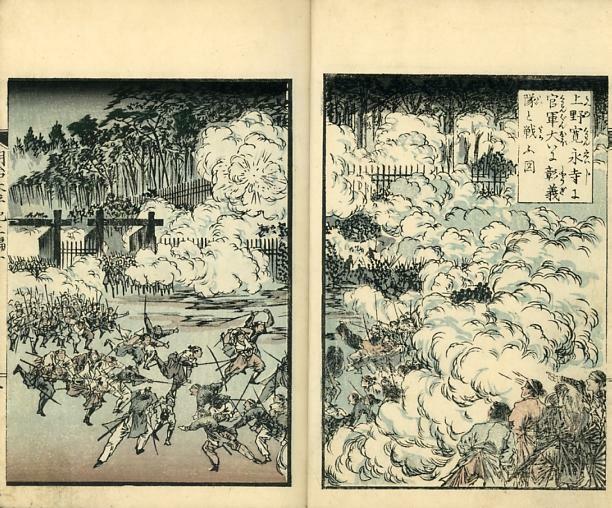 Adding to the irony of starting a series of accounts of civil disturbances and wars too recent to be the subject of "history" is the fact that Murai and Eitaku could not have anticipated the spate of rebellions in late 1876, and the Seinan War of 1877, that would fill the final volumes of the series. Chinese living on Taiwan referred to natives who had submitted to Qing (or other embodiments of Chinese authority), settled near Chinese communities, and taken to Chinese styles of life as shufan (熟蕃, J. shufan) or "cooked savages"). In contrast, natives who did not submit, and therefore did not pay taxes or adopt to Chinese modes of life, and who continued to live in tribes some distance from Chinese and even shufan settlements, were called shengfan (生蕃, J. seiban) or "raw savages". The Chinese terms must have been known to some Japanese long before the 1871 incident that provoked the 1874 punitive expedition (see reviews of Eskildsen 2002 and 2005). While the terms appeared in Japanese writing on the Taiwan Expedition, it was not until after the Sino-Japanese war of 1894-1894 -- which was fought neither in nor over Taiwan but resulted in the ceding of Taiwan to Japan -- that they gained enough currency to earn them inclusion in Japanese dictionaries. Both are now in Kojien, the most widely used desktop Japanese dictionary. The following definitions are from the 5th (1998) edition. seiban -- a different race that does not accept cultivation [kyoka ni fukusanai iminzoku]. Used by the Qing Court to refer to people among the [mountainous] Kozan tribes (Takasago tribes) who had not assimilated with the Han race [Han zoku], in distinction from jukuban. jukuban -- a different race that has been cultivated and has submitted to authority [kyoka sarete kijun shita iminzoku]. Qing Dynasty term used to refer to people among the [mountainous] Kosan tribes (Takasago tribes), which are the indigenous races of Taiwan, who were living on the plains and had assimilated with the Han race. In contrast with seiban. 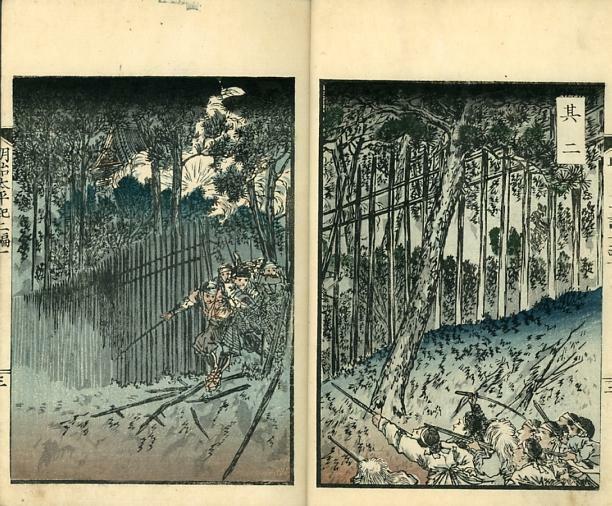 The Shogitai lost a last-stand battle with government troops at Ueno Hill in Edo in 1868 on the eve of the Meiji period. See Shogitai under Politics for related nishikie by Yoshiiku, Eitaku, and Yoshitoshi. Government army in heavy fighting with Shogitai at Ueno Kan'eiji. A second scene of Kan'eiji battle. Japanese papers whetted and fed an appetite for news about the native tribes of Taiwan. Some stories and pictures spread rumors of cannibalism. Others showed them as people in their daily lives. Jukuban [cooked savages] engaged in their vocations on a road.